I’ve lived and worked in Spain for a long time now. Almost 30 years in fact but not until recently have I needed anyone to work for me in my business. I’ve had cleaners and child minders, but never employed anyone in a professional capacity. Until now. I have spent the last month or so searching for someone to sell advertising for me for my Guide to Malaga website. The results so far? Plenty of candidates on paper. Far too wasted time spent by me on emails and phone calls. Zero interviews so zero results and one burning question. Where are the professionals? I begin my search by asking around friends and contacts. Despite having a pretty wide network no one comes up with any good leads. So, I up my game and place an ad on InfoJobs, which my young neighbour reliably informs me is where “everyone looks for a job”. It’s easy to do. Online and they call me to make sure my company and I are bona fide. I also like the option to include some killer questions that, in theory, filter out candidates that aren’t suitable. So, relishing the chance to save myself a lot of time and effort I go for 5 killer questions. 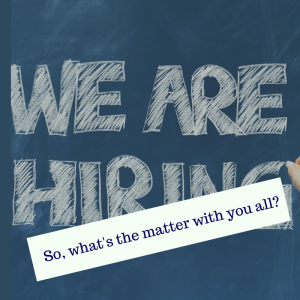 The main questions to weed out the unsuitable are “Do you have sales experience?” and “Are you self-employed or prepared to be so?” Answer no to either of those questions and I don’t receive your CV. So far, so good. I’m generally an optimist and the glass is filling up nicely when I log into my InfoJobs (Business!) account and find 20 CVs submitted. I spend a busy Sunday morning going through them and compiling a list of suitable candidates. All are currently unemployed and looking for a sales position. 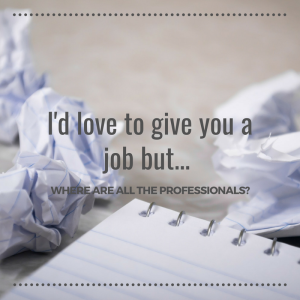 All have that killer-question experience and are self-employed. Good, good, I think. Sales person for Guide to Malaga here we come! I send emails to all my selection (including the lady with an email account “cuquitathebest@gmail”) introducing myself and asking when they’re available to meet. Then I sit back and wait for the replies to flood my inbox. And I wait. After a few days, two guys reply saying they have already found jobs. Another says thank you (yes!) but explains he’s in the middle of a selection process and doesn’t want to waste my time. All very professional. And that’s when the fun starts. I ring several of the candidates. No one answers. A few go through to voice mail so I leave a message. But most just ring out or their phones invite me to send an expensive text saying I’ve called. No reply from anyone I leave a voice mail message for. And these are people looking for a job? I then try again and success! I get through to 3. 2 aren’t prepared to be self-employed (so they lied) and the third, supposedly a freelance journalist and sales person, says he’s only interested if I give him an employment contract for 40 hours a week and pay him €2,000 a month. At this point I take a quick look at his CV and see that he’s 24 and has been unemployed for almost 2 years. I wonder why? So far, so bad. I then get rather depressed about the whole thing but just when I’m about to lose all faith in sales people in Malaga, some more CVs arrive. And they’re all good. All scoring that maximum of 50 points to get through my killers. So I send them an email. And against all odds, 2 reply. 1 guy asks if I can meet him the following week because he’s out of town but he’s (and I quote) “very keen to hear more about the job and likes the sound of it very much”. Yes, yes and yes, I think and blast off a reply saying of course, we can postpone! I attach the Guide to Malaga media pack (which, though I shouldn’t say it myself, is pretty self-explanatory) so he can peruse and get a feel for what this is all about. After a lot of calls and emails, I have come across an entire section of the Malaga population who are supposedly looking for a job yet are unable to reply to emails or answer their phones (or return the call). The few replies I have received have been short, one or two-liners with no introduction or ending. And no one has an email signature. Long story short, I don’t want any of these people working for me. But does anyone else? I talk about this with friends and other business owners and it turns out that my experience isn’t unique. Everyone complains about how demanding potential employees are and how little they expect to give in return. When I say that no one replied, the owner of a successful café in Malaga says, “Oh no, they don’t reply”. Others tell tales of people arriving for an interview clutching union rights. People who ask for later shifts because they can’t get up early. And most amazing of all, a couple of employees in good positions earning good salaries who ask to be sacked so they can have the summer off. What is the matter with everyone? Apart from the fact that I can’t find anyone I want to work for me, the worst thing of all, is that most of these supposed candidates are between 25 and 35. They are Spain’s young working generation. So, what’s the matter with them? Have today’s young people got so used to instant gratification that they’re not interested in actually having to go out and get something? Are young Spaniards so used to living at home and sponging off Mum and Dad that they don’t actually think they need to work? Or if they do work, it’s enough just to earn some pin money because the rest is on their parents. Where does that leave my pension? The candidates actually have no idea about replying to emails and calls. No one has ‘taught’ them those basics of courtesy and education. I know we’re in an era of instant messaging but surely there’s still space for a ‘Dear’ or a ‘Good morning’ at the beginning. And please get the spelling of my name right. Not difficult when it’s in the signature several times and the email address. I will, of course, keep trying although I probably won’t continue with the paid ad on InfoJobs. It seems hard to pay money and then waste so much time. But I can’t say I’m very optimistic about finding someone to sell ad space for me or about the future for Spain generally. I don’t want to generalise – a) because I know a lot of young very hard working Spaniards and b) you can’t take 40 people from Malaga and say everyone’s like them – but the experience has been a real eye-opener. No wonder unemployment among young people in Malaga is so high. Interesting. I am going through the same curve for three of my websites. Out of professionalism, I will not name them but we are in almost identical markets. I have been “looking” for 15+ years and never really found an answer. Well, I have. I do it myself! These people impress me more. They have the gumption to make an unsolicited approach, have to do more than just hit “ping” to send their 3553563rd CV etc. I do not make it a drama. I am unlikely to meet them UNTIL they have sold something. I am not big on excuses and after 40 years l don’t need to know that Sr.Pérez did not return the form. Thanks Steve. Useful advice I have since found a couple of people who I think will be good. I appreciate that sales is a difficult area but my main concern in the piece was the lack of professionalism.